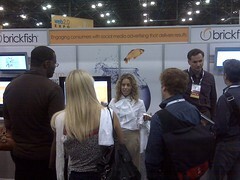 Special thanks to Ashley Futak for her post on Brickfish at the Web 2.0 Expo that was held in New York City last month. To get more information on where Brickfish will be next, contact Ashley at AshleyFutak@brickfish.com. The Web 2.0 Expo in New York was filled with firsts for Brickfish. It was the first time, as a company, that we were an exhibitor for an event of this scale. It was my first time attending an Expo, let alone orchestrating the whole thing (you would be surprised how much work goes into putting an exhibit together!). It was also the first time we were able to explain Brickfish to a crowd of people who were intimately familiar with Social Media and all that Brickfish has to offer. business models or to their everyday life. That said…our booth was packed! From the moment the Expo opened until the moment it closed, we were busy sharing the Brickfish experience with anxious listeners! If we weren’t giving demonstrations, we were walking visitors through the Brickfish site, or handing out our new marketing materials. It was so exciting to watch this start-up company from San Diego emerge onto the playing field with some of the biggest names on the Web today, and to establish ourselves as the leader in Social Media Advertising.